Conquering a struggling Bangalore Royal Challengers with ease, King’s XI Punjab emerged on top of the league table with an easy six wicket win in the DLF Indian Premier League at the M Chinnaswamy stadium here today. Smarting from their eight-wicket defeat to Rajasthan Royals in Jaipur, Chennai Super Kings have a very good opportunity to get back to winning ways when they take on cellar-dwellers Deccan Chargers in the Indian Premier League Twenty20 tournament here tomorrow. 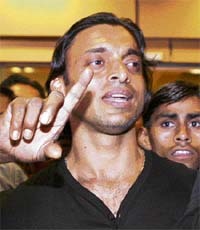 Pakistan Cricket Board chairman Nasim Ashraf today withdrew his Rs 220 million defamation suit against fast bowler Shoaib Akhtar after a top government official mediated a reconciliation between them. The meeting, which took place in Islamabad on Sunday night, was brokered by Rehman Malik, a top man in the ruling Pakistan Peoples Party and advisor to the Prime Minister on interior affairs. Both Shoaib and Ashraf were present in the meeting. LAHORE: After allowing Misbah-ul-Haq to play for liquor baron Vijay Mallya-owned Royal Challengers Bangalore in the IPL, the Pakistan Cricket Board (PCB) is in trouble as it is in conflict with its policy of discouraging players from associating themselves with alcohol brands. BCCI-appointed Commissioner Sudhir Nanavati, inquiring into the slapping row after an IPL match, has summoned here Harbhajan Singh and S Sreesanth, the two players involved in the episode 10 days ago. Rumeli Dhar missed her maiden one-day international century but guided India to a thumping 182-run victory over arch-rivals Pakistan in the women's Asia Cup in Kurunegala, Sri Lanka, on Monday. 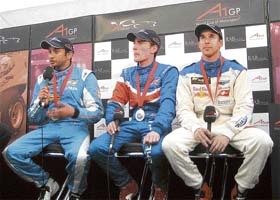 Elated after finishing the A1GP's season finale with a win at the Brands Hatch Circuit, ace Indian driver Narain Karthikeyan said it is one of the better wins of his career. ''It was a great way to end the year. To win in England - it's a great driver's circuit - is awesome,'' Karthikeyan told CNN IBN. A fierce contest between Chandigarh and Jharkhand was witnessed on the fourth day of 25th Sub-junior national-level boys handball tournament currently underway at Kirpal Sagar Academy, near Rahon, in the district. The match ended in a tie as both teams scored 35 goals each. A strokeful 82, with two sixes and 12 boundaries, by Delhi Ranji Trophy player Vijay Dahiya propelled Air India to a seven-wicket victory over defending champions Oil and Natural Gas Corporation in the title clash of the 18th All-India Om Nath Sood Memorial Cricket Tournament for the Sperry Trophy at the Roshanra ground here. Kings XI Punjab owner Preity Zinta during her team's IPL T20 match against Bangalore Royal Challengers at Chinnaswamy stadium in Bangalore on Monday. With this win, Punjab joined Rajasthan Royals with five wins in seven matches at the top of the league table, while Royal Challengers crashed to their fifth defeat in as many matches. Chasing an easy target of 127, Punjab played with ease as young Aussie batsmen Shaun Marsh (39) and Ramnaresh Sarwan (31) took the visitors to an easy victory with ten balls to spare. Kings XI lost James Hopes early in the second over, but Marsh and Sarwan who played with confidence put the result beyond doubt and always kept the target within sight. Sarvan was more authoritative of the duo, negotiating the Bangalore bowlers with ease. He struck four fours and a six off Praveen in his 30-ball essay and added a match winning 54 for the second wicket in 44 balls. Marsh struck 39 in 34 balls hitting four fours and a six. Earlier, the poor run of Bangalore Royal Challengers continued as they were bundled out for just 126 by Kings XI Punjab, despite a fighting knock of 66 by skipper Rahul Dravid. The local team, who scored a morale boosting win against Deccan Chargers after a series of losses, again found themselves in the rut as Kerala Speedster S. Sreesanth rattled the top order with two wickets in the very first over. Challengers never recovered after the disastrous start and it was left to Dravid to plough a lone borough to take the Challengers past the century mark. Wickets fell in a heap after Dravid added 54 runs for the fourth wicket with Virat Kohli (34) but the home team was never in the hunt for a challenging score and could not even play the full overs as they crashed to a disappointing score with four balls still left in their innings. Kohli, the World Cup winning under-19 captain, was the only other notable scorer with 34 runs. The Challengers created a dubious record with five of its batsmen getting out without score, the first such happening in the cash-rich IPL. Sreesanth troubled the Bangalore batsmen with pace and movement, both in the air and off the wicket, in his first spell of 3-0-9-2 and this put the skids on the Challengers who could never recover from the early blues. Dravid, who came to the wicket at the fall of Kallis who was run out going for a non-existent run in the fourth over and stayed till the penultimate over but couldn’t help his team to recover the way he wanted. But still it was a masterly knock from the batsman, who remains excluded from the national one-day squad. Dravid struck nine boundaries and the lone six of the innings in his 51-ball stay. Pathan proved an able foil for Sreesanth and conceded just 13 runs in 3.2 overs he bowled while the former conceded just 16 runs in his full quota of four overs. Fall of wickets: 1-1, 2-1, 3-15, 4-69, 5-98, 6-98, 7-102, 8-116, 9-124. Bowling: Sreesanth 4-0-16-2, I. Pathan 3-2-0-13-1, Gagandeep 3-0-28-0, VRV Singh 4-0-33-3, P. Chawla 4-0-25-3, Hopes 1-0-10-0. Player of the match: S Sreesanth (Kings XI Punjab). Smarting from their eight-wicket defeat to Rajasthan Royals in Jaipur, Chennai Super Kings have a very good opportunity to get back to winning ways when they take on cellar-dwellers Deccan Chargers in the Indian Premier League (IPL) Twenty20 tournament here tomorrow. It is a critical game for both teams as it comes at the halfway stage in the league. The Super Kings are currently placed fourth in the leaderboard that they once led with four consecutive victories. The Chargers occupy the last spot with one win from six outings. If anything, the Super Kings would not have to deal with another Sohail Tanvir or a Shane Warne as the Chargers are struggling to put up an effective combination that can fetch them much-needed success. But the Super Kings' much-vaunted batting line-up has not really clicked since the departure of the two Australians, Matthew Hayden and Mike Hussey. They are also missing the big-hitting all-rounder Jacob Oram who left for New Zealand just as he was getting into a wicket-taking mode. Although the Super Kings have put on a bold front in view of the replacements - Stephen Fleming, Albie Morkel and Makhaya Ntini - the fact remains that the side just did not show the discipline required during their defeats to Delhi Daredevils and the Royals. Coach Kepler Wessels has been at pains to stress that the Super Kings would not miss the three foreign recruits, but the two consecutive defeats have only shown up the team's soft underbelly. The Chargers would be hoping to capitalise against a team that is decidedly low on confidence. The V.V.S. Laxman-led Hyderabad outfit has so far only promised a lot, but delivered next to nothing, even granting that they did come close to winning a couple of games. The presence of Adam Gilchrist and Herschelle Gibbs at the top of their batting order has not really reflected in the totals they have put up or chased. Laxman himself has not shown a comfort level, as a captain and a batsman, to have anyone believe that he is cut out for this format of the game. The only thing going for the Chargers is that they can play with more freedom since they have everything to gain and nothing to lose while the Super Kings have to win to remain in the hunt as serious contenders for a semi-final spot. As has been the trend, both teams have kept their options open for the last possible moment before deciding on the final composition of their respective playing elevens ahead of the 8 p.m. start. Chennai Super Kings: Mahendra Singh Dhoni (captain/wicket-keeper), Stephen Fleming, Makhaya Ntini, Muttiah Muralitharan, Albie Morkel, Joginder Sharma, Suresh Raina, Parthiv Patel (wicket-keeper), Vidyut Sivaramakrishnan, Abhinav Mukund, Suresh Kumar, Arun Karthik, Shadab Jakati, Napoleon Einstein, Subramaniam Badrinath, Lakshmipathy Balaji, R. Ashwin, Srikkanth Anirudha, Viraj Vilas Kadbe, Palani Amarnath and Manpreet Gony. Twenty20 cricket made a belated but dramatic entry into the country. The enthusiasm shown by fans and the attendance in the DFL IPL match venues suggest that the latest version of the game is being lapped up by players and spectators alike. D.P. Azad, the first recipient of Dronacharya award in the country, feels that the shortest version of the game could be good for spectators or players but it will have adverse effect on budding cricketers, which, in turn, could damage Indian cricket. “The youngsters, who have just started to pick up the fundamentals of the game, must not be over-exposed to this variety of the game,” stated Azad, the coach of former India players like Kapil Dev, Chetan Sharma and Ashok Malhotra, emphatically. “At a cricket academy, I was stunned to see the kids attempt cross-batted and other innovative strokes seen in the T20 matches. I told them not to attempt such strokes and stick, instead, to the basics,” he said. “The ill-conceived stroke played by Misbah-ul Haq off Joginder Sharma in the last over to be caught by Sreesanth at square leg in the Twenty20 final between Indian and Pakistan will not be found in any coaching manual and should not be tried by a youngster,” Azad stated. Youngsters’ keenness to play such strokes, Azad felt, could be attributed to the widespread coverage of the T20 matches on TV. Such strokes, if they start playing at a tender age, will never stand them in good stead in the traditional version of the game, the distinguished coach said. “As cigarette packs and liquor bottles carry the health warning tag, so must be the case with T20 cricket,” D.P. Azad, former member of the BCCI technical committee, said. Azad lamented that T20 tournaments for boys in as young an age group as U-13 were being organised. Recently, an U-13 national championship was organised in Chandigarh. “Such tournaments for the so-young are not organised by the Board of Control for Cricket in India (BCCI). Others should not also do it. Otherwise, cricket will suffer,” he warned. Pakistan Cricket Board chairman Nasim Ashraf today withdrew his Rs 220 million defamation suit against fast bowler Shoaib Akhtar after a top government official mediated a reconciliation between them. The meeting, which took place in Islamabad on Sunday night, was brokered by Rehman Malik, a top man in the ruling Pakistan Peoples Party and advisor to the Prime Minister on interior affairs. Both Shoaib and Ashraf were present in the meeting. Tafazzul Rizvi, the lawyer who filed the defamation suit in the civil court on behalf of Ashraf, said Akhtar had shown remorse for his remarks and behaviour and asked for forgiveness. The lawsuit was filed in a Lahore court and was to come up for hearing on May 16. "Shoaib apologised to Nasim Ashraf in person and accepted that he had levelled false and baseless allegations against him in the meeting," Rizvi told PTI. The PCB chief had filed the defamation suit against Akhtar after the fast bowler alleged on a television show that he (Ashraf) had demanded money from him and other players for signing Indian Premier League contracts. "Ashraf has decided not to pursue the defamation suit against the pacer and it will be withdrawn since his honour and dignity stand vindicated," Rizvi said. Ashraf confirmed that he had dropped the defamation suit against Shoaib Akhtar and had forgiven the banned fast bowler after his repeated public apology. Akhtar also expressed happiness that he had a rapprochement with Ashraf which he said became possible after intervention by leading political personalities of the country. He thanked political figures Asif Zardari, Nawaz Sharif, Shahbaz Sharif, Altaf Hussain and Rehman Malik for the interest they took in his case and for helping him out. "I went for a rapprochement because this issue was causing a lot of harm to Pakistan and our cricket and it was not good. I wanted this to end," he said. 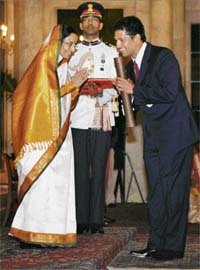 Akhtar said he was now going to India with the blessings of the Board Chairman and the prayers of the people. Rizvi said as far as the Appellate tribunal proceedings are concerned they are totally independent and have got no link with the defamation suit. PCB CEO, Shafqat Naghmi said the board does not encourage its players to promote alcohol products. ''Players usually take prior clearance for endorsing or starring in any brand commercials. I am not sure whether Misbah has taken permission for the Royal Challengers and I am also not sure whether he is required to wear or market any brand of the UB group,'' Naghmi said. ''But yes we do discourage our players from even sporting logos promoting alcohol or tobacco products,'' he admitted. "I have summoned them. They have been told to come either on Friday or Saturday. Harbhajan will be coming on Friday. Sreesanth is yet to confirm a date," he told PTI today. Nanavati has been asked by the board to probe the incident which happened after the IPL match between Mumbai Indians and Kings XI Punjab. "I have already recorded statement of one of the umpires of the match, Amisha Saheba. I will be meeting the match referee Farokh Engineer tomorrow in Mumbai," Nanavati said. Nanavati is expected to submit his report by April 12 to the BCCI disciplinary committee as he was given 15 days time when the board appointed him as the commissioner. "I have received all the documentary evidence and also video footage of the incident," Nanavati said. The inquiry by the BCCI on the slapping incident was separate from the verdict reached by IPL match referee Farokh Engineer who had suspended Harbhajan from playing a minimum of 11 IPL matches. Dhar hit an unbeaten 92, her highest score in 51 ODIs, and Asha Rawat scored a painstaking 69 as India posted 275 for seven in their stipulated 50 overs after electing to bat and then restricted Pakistan to 93 for 9 in 50 overs. Elated after finishing the A1GP's season finale with a win at the Brands Hatch Circuit, ace Indian driver Narain Karthikeyan said it is one of the better wins of his career. ''It was a great way to end the year. To win in England - it's a great driver's circuit - is awesome,'' Karthikeyan told CNN IBN. For Karthikeyan, the victory is all the more special since he had the pole position. ''Every win is special and to win the last race of the year is even more special. It's a much better win because we had the pole position and the win as well. Great feeling,'' he gushed. ''When you have a pole position, you know you are the best and it gives you a lot of confidence. It was really a controlled drive. There were some moments of fear but we got over them. I am very happy,'' he added. The Chennai lad sounded upbeat about the future of team India. A fierce contest between Chandigarh and Jharkhand was witnessed on the fourth day of 25th Sub-junior national-level boys handball tournament currently underway at Kirpal Sagar Academy, near Rahon, in the district. The match ended in a tie as both teams scored 35 goals each. Varun of Chandigarh and Ramesh of Jharkhand were the star performers. In other league matches, Punjab beat West SAI 17-10, Himachal Pradesh and New Delhi mauled Madhya Pradesh and Uttaranchal 27-5 and 16-1 respectively. UP beat Orissa 22-11 and Andhra Pradesh beat Mumbai Handball Academy 22-18. In the 10th mini girls national-level championship, Punjab beat Karnataka 15-11 and Mumbai Handball Academy 19-7, Andhra Pradesh beat Tamil Nadu 12-4, Haryana beat Rajasthan 8-2, Bihar beat Karnataka 22-15, Manipur beat Andhra Pradesh 18-12, Kerala beat Chhattisgarh 12-6. A strokeful 82, with two sixes and 12 boundaries, by Delhi Ranji Trophy player Vijay Dahiya propelled Air India to a seven-wicket victory over defending champions Oil and Natural Gas Corporation (ONGC) in the title clash of the 18th All-India Om Nath Sood Memorial Cricket Tournament for the Sperry Trophy at the Roshanra ground here. Mohd Saif was adjudged the Man of the Series while Vijay Dahiya received the Man of the Final award. Brief scores: ONGC: 205 (Sandeep Sharma 32, Rizwan Shamshad 21, Ajay Ratra 57, Mohd Saif 38 n.o., Sumit Narwal 19, Vineet Jain 2 for 37, Sachin Rana 2 for 47, Rohit Prakash 2 for 24). Air India: 219 for 3 (Vijay Dahiya 82, Manvinder Bisla 44, Shafiq Khan 50 n.o. ).